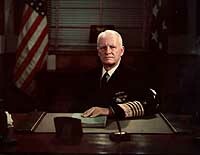 Fleet Admiral Chester W. Nimitz, USN, (1885-1966). 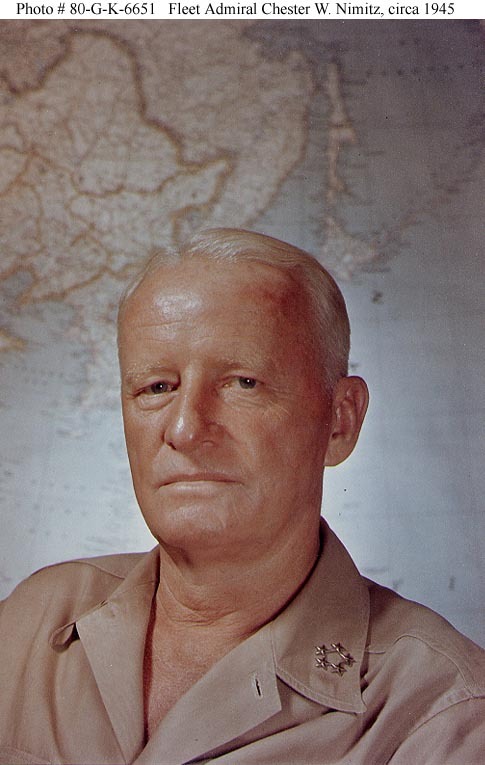 Chester William Nimitz was born in Fredericksburg, Texas, on 24 February 1885. Appointed to the U.S. 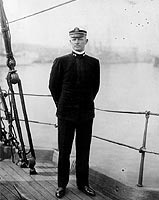 Naval Academy in 1901 and graduated in 1905, he then spent four years with the Asiatic Fleet. During that time he commanded the small gunboat Panay and the destroyer Decatur (DD-5). 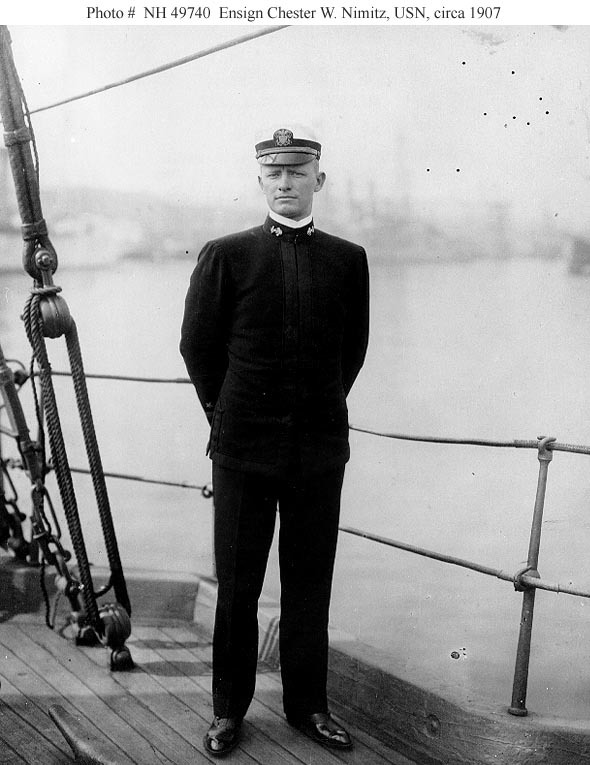 In 1909-13, after his return to the United States, Lieutenant Nimitz was assigned to submarine duty, gaining a reputation as an expert in the field of undersea warfare. He also earned a Silver Lifesaving Medal for rescuing a sailor who fell overboard. Nimitz was next sent to Germany to study diesel engine technology. He put that knowledge to work during 1913-17 supervising the construction and installation of diesel engines in the oiler Maumee (AO-2) and serving as her Chief Engineer. 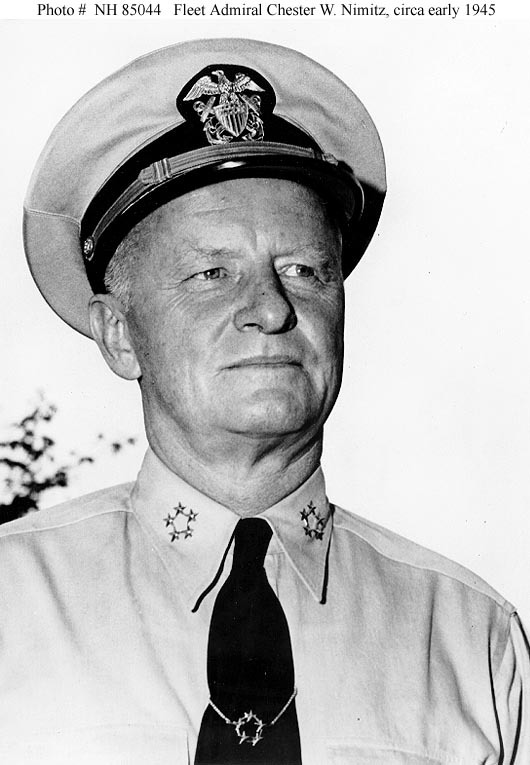 After promotion to Lieutenant Commander, Nimitz returned to the Submarine Force. Following a year as Executive Officer of the battleship South Carolina (BB-26), in 1920 he went to Pearl Harbor to build the submarine base there. 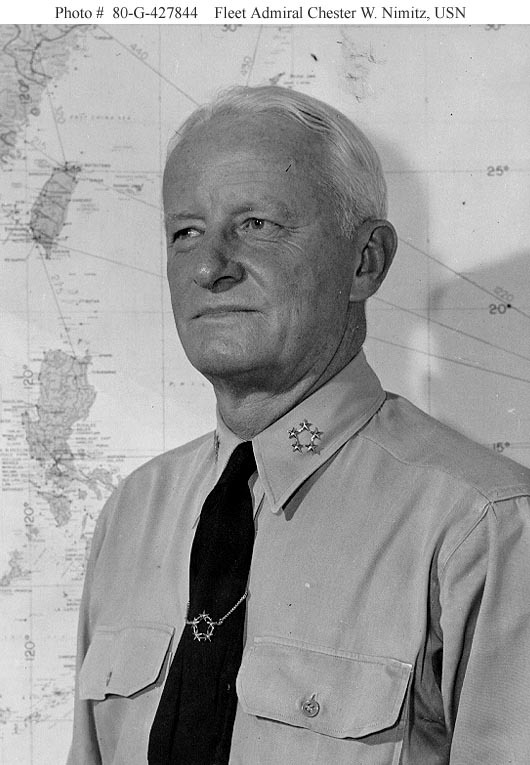 Next assigned to the Naval War College, his studies of a possible Pacific Ocean war's logistics would become extremely relevant two decades later. 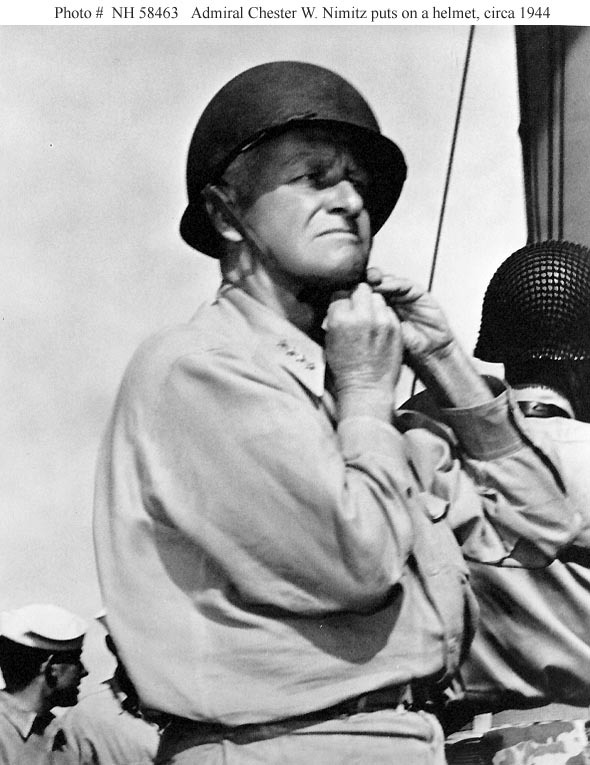 In 1923, Commander Nimitz became aide to Commander Battle Force and later to Commander in Chief, U.S. Fleet. 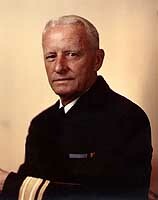 Later in the decade, he established the NROTC unit at the University of California at Berkeley. In 1929, now holding the rank of Captain, he began two years as Commander, Submarine Division 20, followed by two more years in charge of reserve destroyers at San Diego, California. He then took the heavy cruiser Augusta (CA-31) to the Orient, where, under his command, she was flagship of the Asiatic Fleet in 1933-35. Three years' duty at the Bureau of Navigation in Washington, D.C., ended in 1938 with his promotion to Rear Admiral. 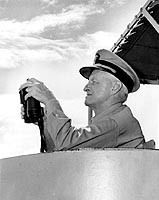 As a flag officer, Nimitz commanded Cruiser Division Two and Battleship Division One until he became Chief of the Bureau of Navigation in June 1939. He held that post during the difficult years leading up to U.S. entry into World War II. 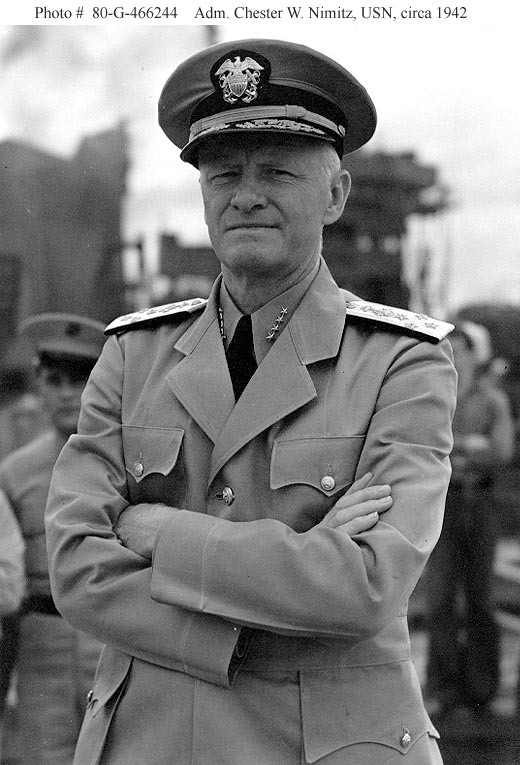 In the wake of the destructive 7 December 1941 Japanese attack on Pearl Harbor, Nimitz was ordered to take over the Pacific Fleet. With the rank of Admiral, and Fleet Admiral after December 1944, he commanded American forces during their long advance across the Pacific to full victory in August 1945. 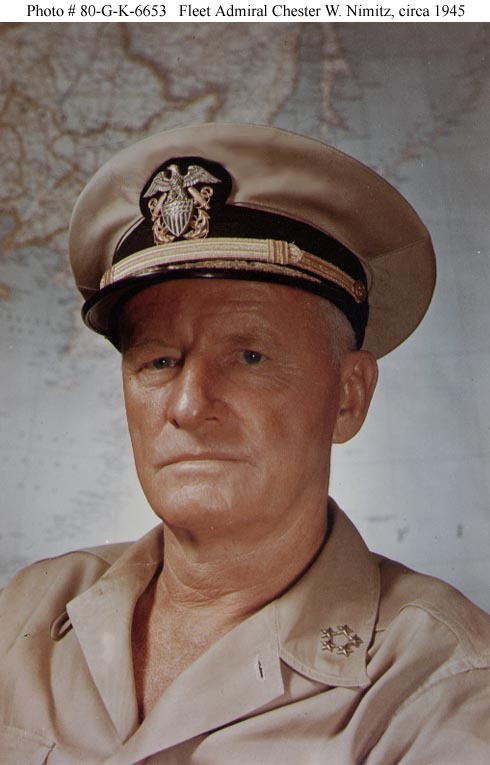 Fleet Admiral Nimitz became Chief of Naval Operations in December 1945. On his watch, the Navy endured a massive postwar downsizing and began to find its place in the peacetime national defense establishment. He left office in December 1947, taking residence in California. As a Fleet Admiral, he technically remained on active duty, and in 1949-52, served at the United Nations. 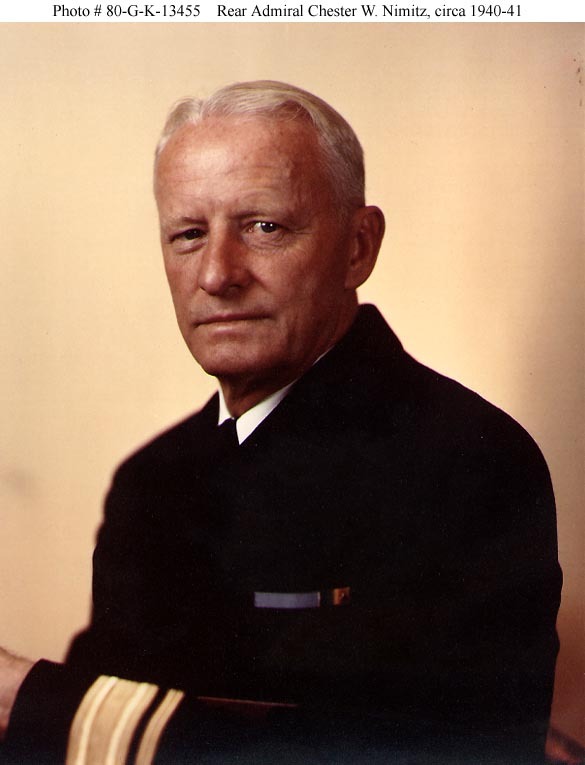 Fleet Admiral Chester W. Nimitz died at his home on Yerba Buena Island, California, on 20 February 1966. The aircraft carrier USS Nimitz (CVN-68), 1975-____, is named in honor of Fleet Admiral Nimitz. 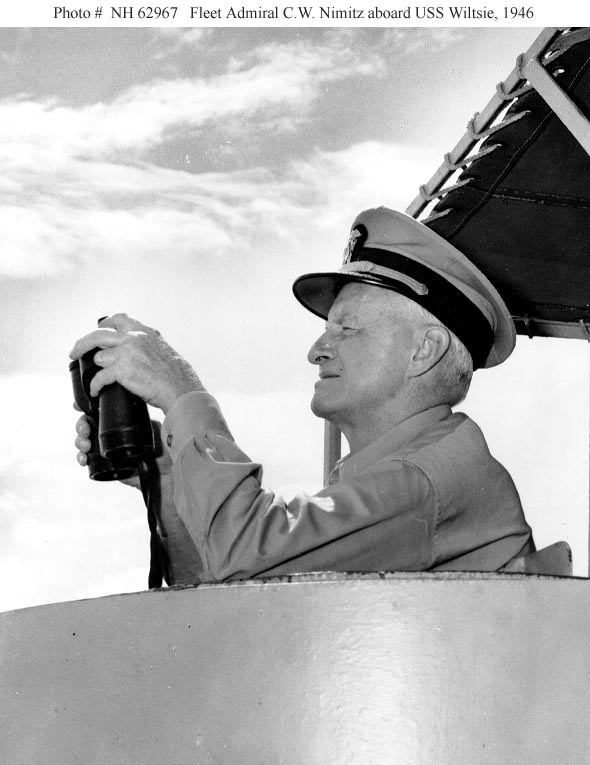 This page features selected individual photographs of Fleet Admiral Chester W. Nimitz and provides links to other pictures of him. On board a U.S. Navy training ship, circa 1907. Collection of Fleet Admiral Chester W. Nimitz, USN. Portrait photograph taken circa 1940-41, probably while he was Chief of the Bureau of Navigation. 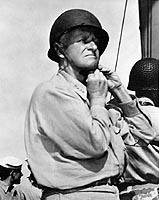 Puts on a battle helmet while visiting a U.S. Navy ship, circa 1944. 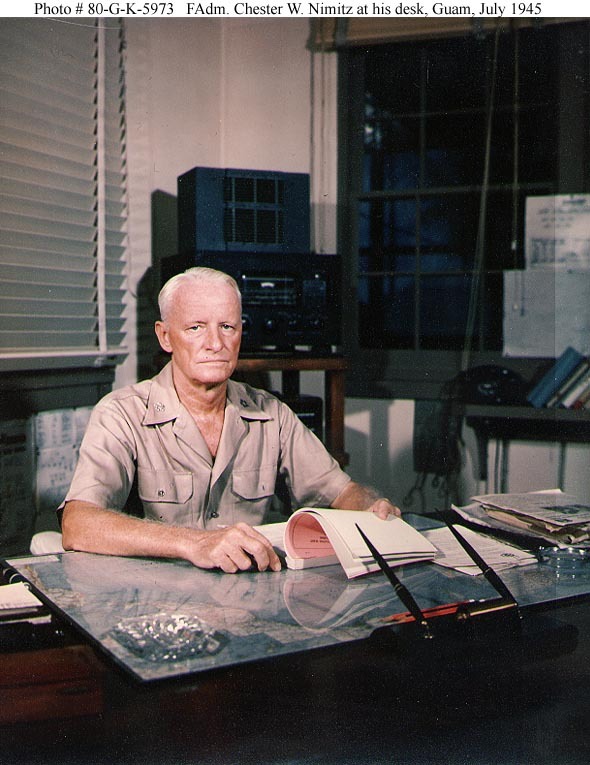 Photographed in his office at CinCPac/CinCPOA Advanced Headquarters on Guam, probably when he received his fifth star, circa 16-19 December 1944. The five-star tie clasp was a gift to him. Commander in Chief Pacific Fleet and Pacific Ocean Areas. Portrait photograph, taken circa 1945. 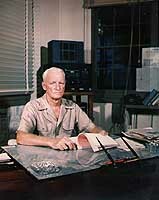 At his desk at CinCPac/CinCPOA Advanced Headquarters, Guam, in July 1945. At his desk at the Navy Department, circa December 1945 - December 1947. Watches a demonstration of anti-submarine weapons, while on board USS Wiltsie (DD-716) in the Atlantic, 11 May 1946.